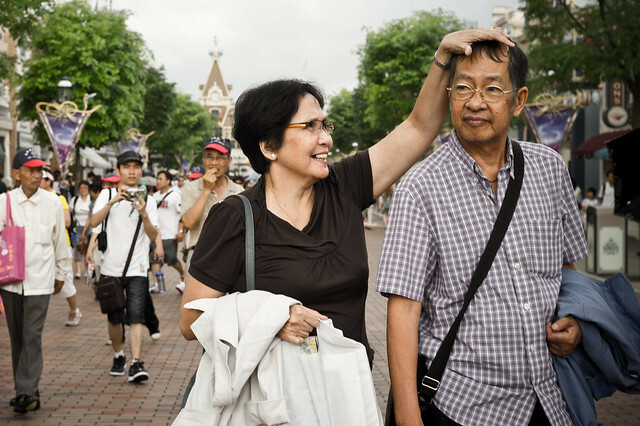 The second day in Hong Kong was mostly spent at Hong Kong Disneyland. 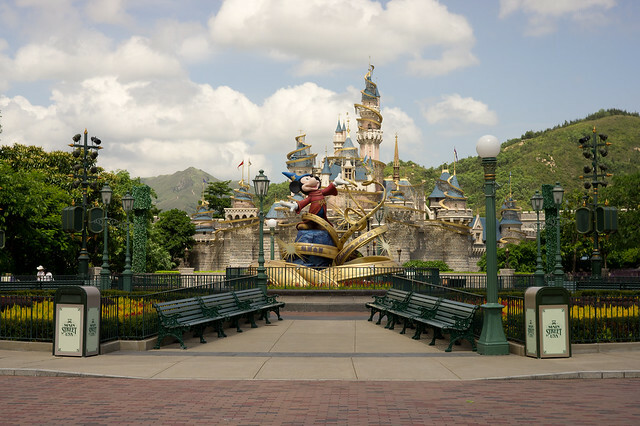 Just like Universal Studios Singapore, Hong Kong Disneyland is located far away from the busy city center. 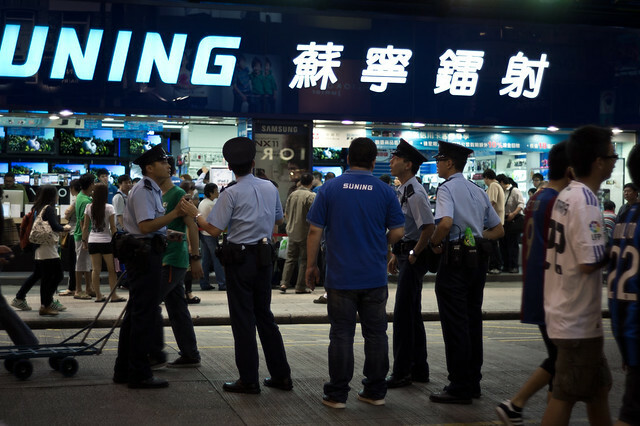 It rests on reclaimed land at Lantau Island. 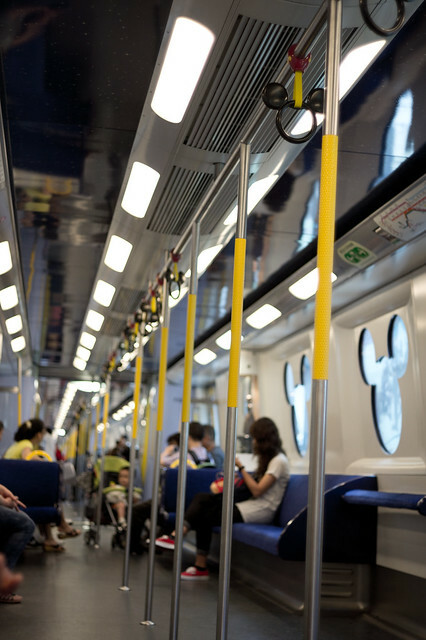 There are a few options to travel to the park: the most popular being public transport, the Mass Transit Railway (MTR) of course. 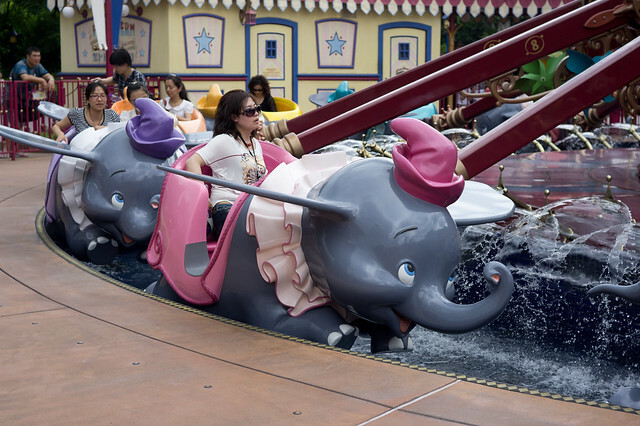 Day Tickets at Hong Kong Disneyland goes for HK$350, which is equivalent to about S$56. The price is the same for any day in the year and can be used on most days, anytime 6 months after date of purchase. However, for some special days, such as public holidays, tickets will need to be purchased with a confirmed date of use. 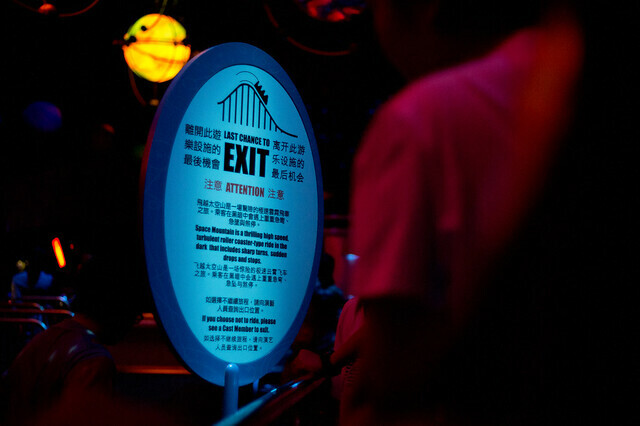 The park also offers Annual Passes, called the Magic Access which is split into 4 tiers of membership and is priced from HK$2400 to HK$650. 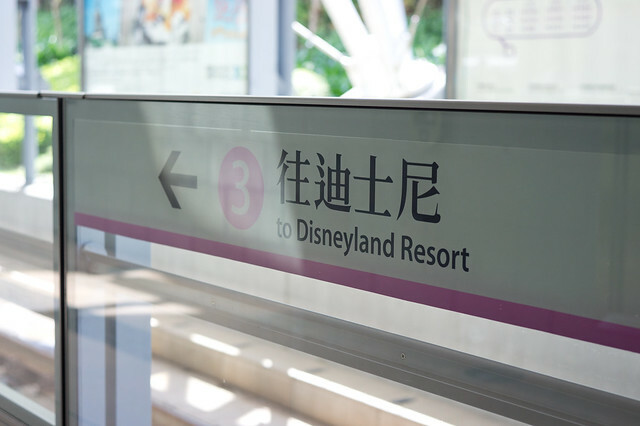 The Disney experience begins the moment one arrives at Sunny Bay, the interchange station between the Tung Chung line and the Disneyland Resort line. Typically, the iconic Disney train will be there waiting for eager guests to run across the transfer platform. There is a little fanfare during the ride to Disneyland Resort, with a special message being played in the train cabins. 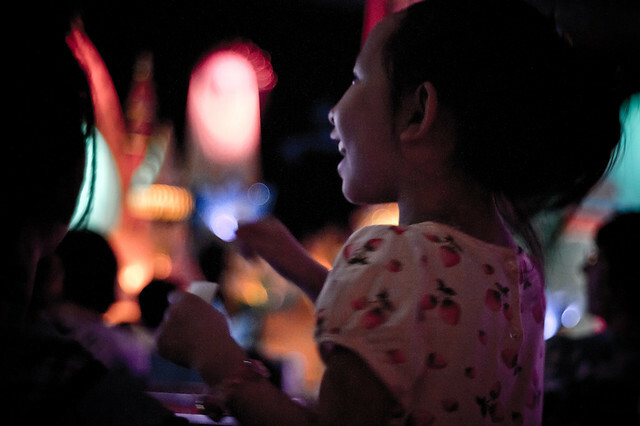 It is all part of a thematic journey, transforming from “modern city of Hong Kong” to the “magical world of Hong Kong Disneyland”. Visually, the stations were designed very differently as well – with the Sunny Bay station having a lot of glass and white roof work, looking like most of the other stations in Hong Kong. Visitors will be surprised with a spacious Modern-Victorian design at the Disneyland station. The entrance area of the park has been decorated for the park’s 5th Anniversary festivities, Celebration in the Air. It is quite a cohesive theme and includes some tweaks to the park’s merchandising, decorations and is supported by a very impressive daytime parade show and night castle show. It was a Tuesday when my family went to the park – although marked as an off-peak day, there was a lot of people. FASTPASS is no longer a novelty, it is a necessity if you wish to do the rides multiple times. As for the park crowds, it’s comparable to a school holiday weekend at Universal Studios Singapore. 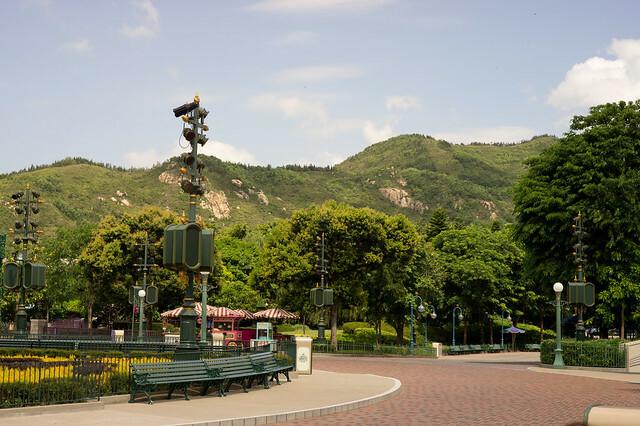 If you are wondering why the photos below show an empty park, here is the explanation: The main gates of Hong Kong Disneyland opens 30 minutes before the scheduled timing (usually 10:30AM). Only the Main Street area is accessible, for some quick bites or (hopefully not) overly well-planned shopping. A rope is held in place at the end of Main Street, just before the roundabout (where Sorcerer Mickey is) in front of the castle. Moments before 10:30AM, there is a ceremony called “First Family” where a family is chosen to open the park by “cutting” a ribbon. 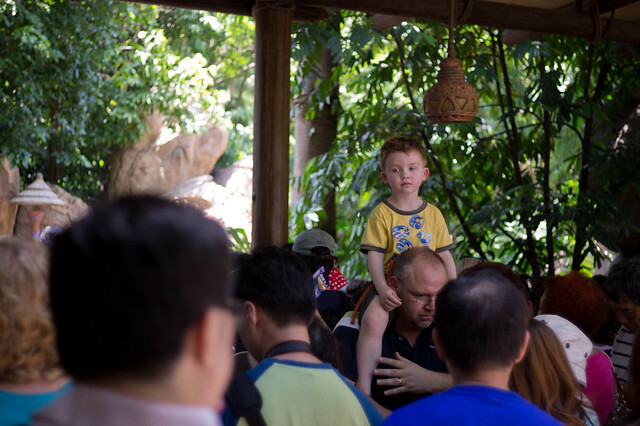 The First Family thing is an opportunity is given out to families with small children who at the gates during park opening. Apart from this little fanfare and some special photo-op moments, I recall reading somewhere that the First Family also rides down Main Street before a parade starts, but I’m not sure if that is done anymore during the 5th Anniversary Celebrations. 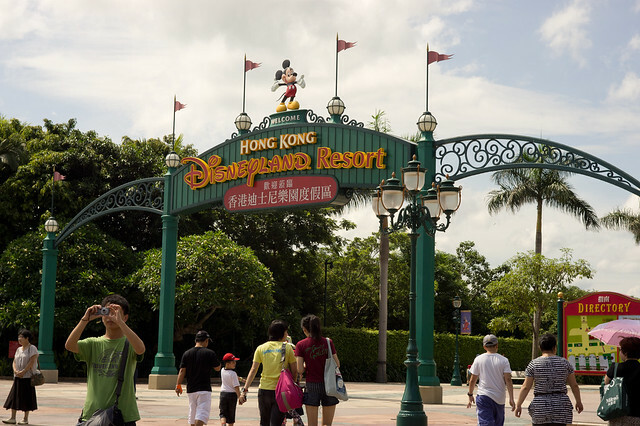 The location for Hong Kong Disneyland is unlike any other Disney parks. The lush mountain backdrop frames the park beautifully, masking any hints of the outside world. 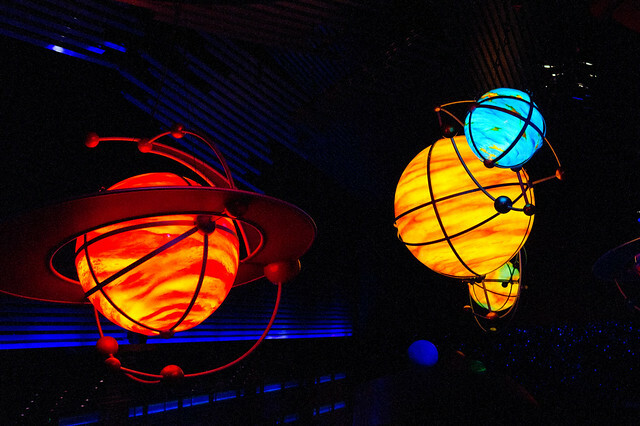 While yes, the park is entirely artificial and built on reclaimed land, the surrounding landscape creates an illusion – a “magical” one that is reinforced with thematic music – to trick the guests that they are in some other world. 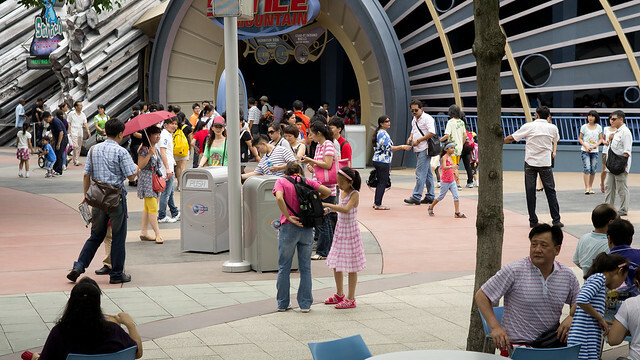 I really wished Universal Studios Singapore had the large walking spaces between park zones, which offers breathing space between each zone’s thematic design. 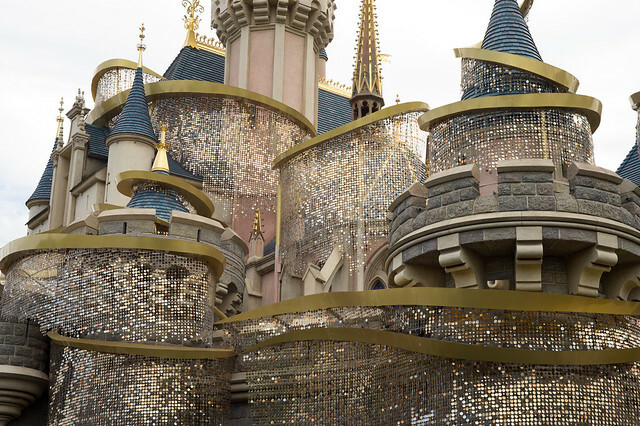 As part of Celebration In The Air, Sleeping Beauty Castle has embellished with golden trails and sparkly pixie dust by Tinker Bell! 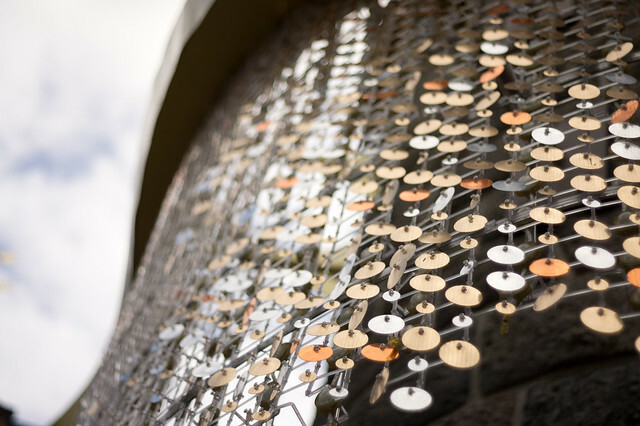 The “sparkly” effect is made out of shiny metallic discs that moves with the wind, creating a graduated shimmering effect. This is similar to the kinetic art by Ned Kahn, which has been replicated at many places, including the Wind Arbor at Marina Bay Sands. 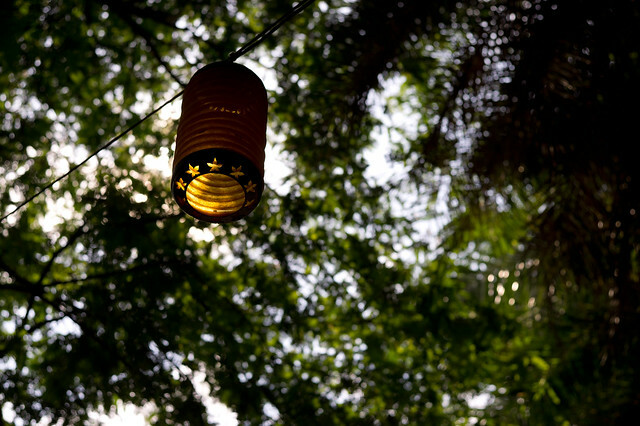 Hidden behind the curtains of discs are LED lighting arrays. 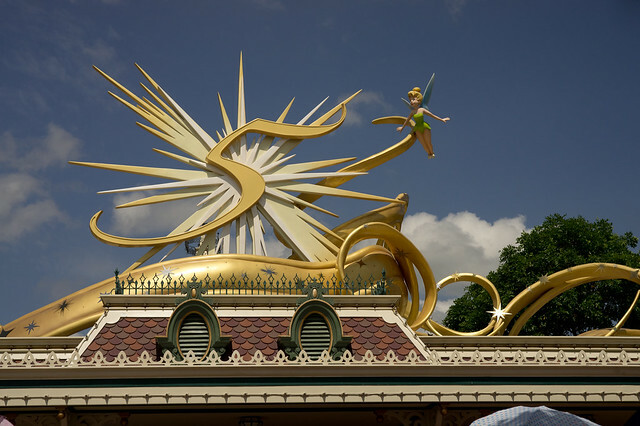 The evening castle show, known as Tinker Bell Castle Illumination, is a dazzling spectacle. Another important element of Celebration In The Air is the Flights of Fantasy Parade which unfortunately I have no photos to provide. It is a stunning parade and has been compared to some of Tokyo Disneyland’s parades by some theme park fans. There are 7 parade floats in total: Dumbo + Mickey and Friends, Winnie The Pooh, Disney Princesses, Jungle Book/Lion King, Tinker Bell, Lilo and Stitch – and lastly, Toy Story. The theme song is very catchy, memorable and uplifting (well, it’s about flying, after all). So come on! come on! come on! 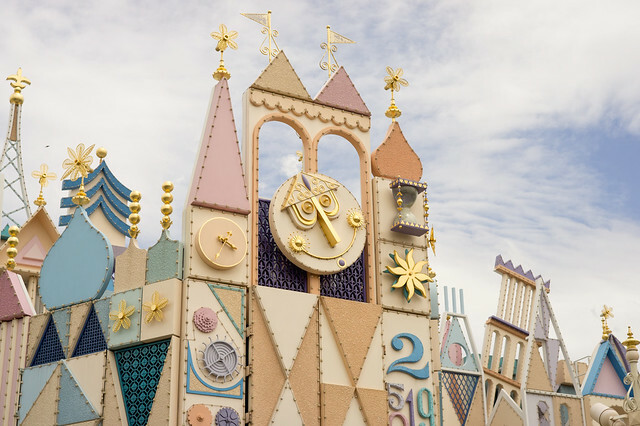 Originally created for the UNICEF Pavilion in the 1964 New York World’s Fair, it’s a small world is one of the few attractions that exists in all Fantasyland zones around the world. 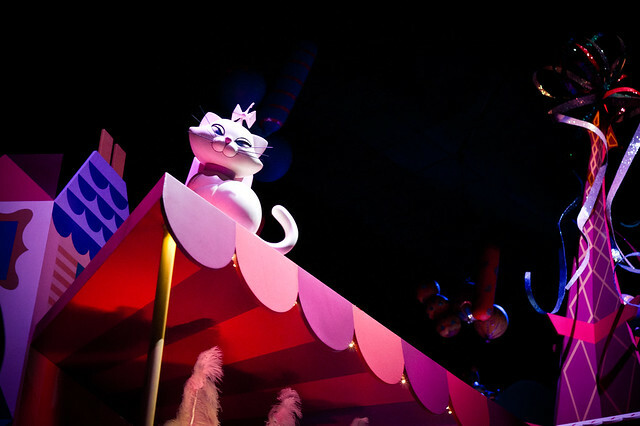 It is a gentle indoor boat ride that sails through various colourful scenes with animated characters singing the same tune. Although the music might drive some people crazy, this attraction is well-known for its very high-capacity per hour, which has influenced future Disney attractions in their design, such as Pirates of the Caribbean (from a walkthrough attraction into boat ride). 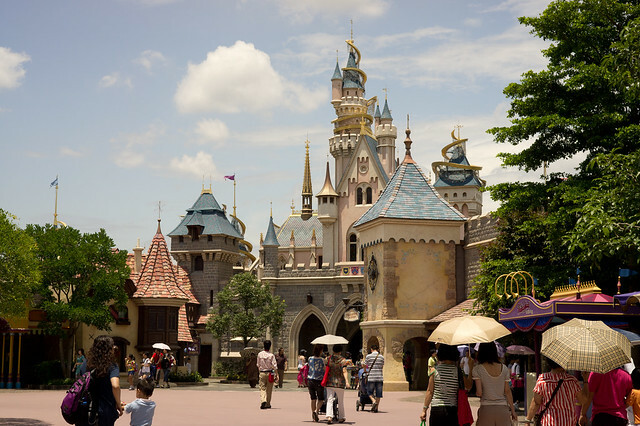 In Hong Kong Disneyland, it is also one of the most comfortable rides to enjoy in a hot summer day. 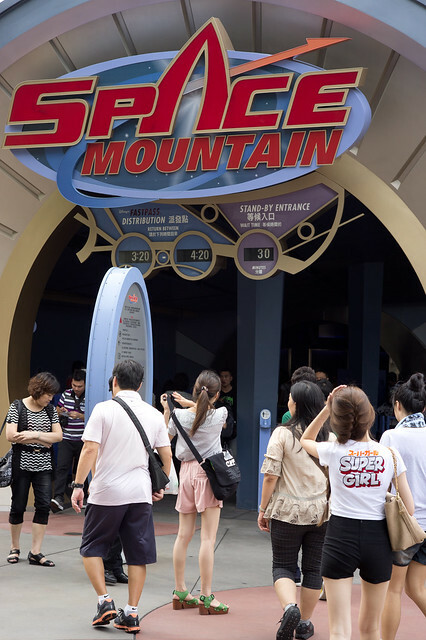 In contrast to Universal Studios Singapore, which has several roller-coasters, Space Mountain is now the only high adrenaline adventure in Hong Kong Disneyland. One commonly heard rationale is that the locals prefer photo opportunities compared to intensive rides. This is set to change with the construction of new attractions in the three new themed zones, to be completed in 2013. 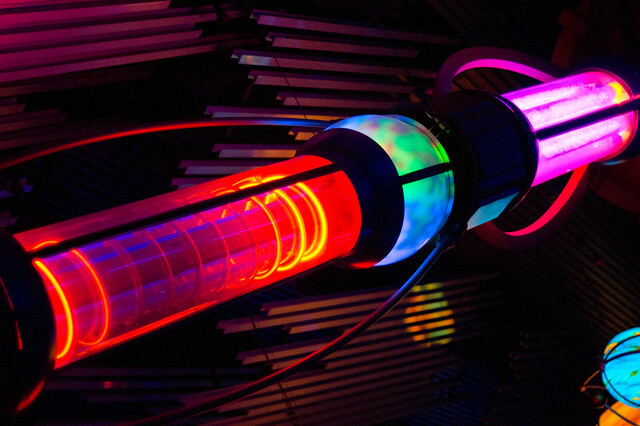 Despite being a smaller, more compact version compared to the other Space Mountain attractions in the world, this ride has a slightly different theme and queue design. There is also a lot of detail in the design of the loading/unloading area. 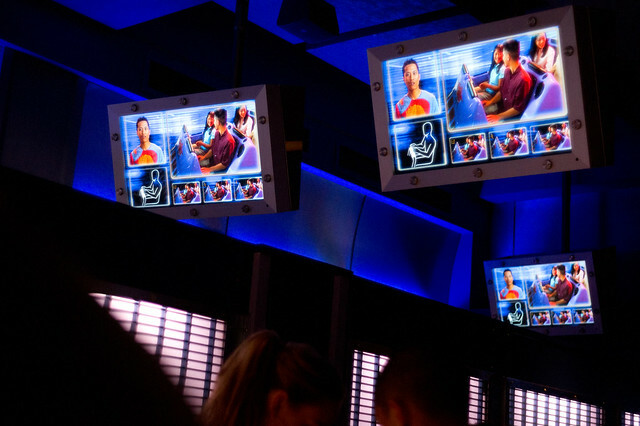 The ride safety video is also carefully done to be both succinct and heavily themed, something which was perfectly executed for Battlestar Galactica in Universal Studios Singapore back in 2010, but was unfortunately altered in the 2011 reopening with “real-world videos” spliced in between themed sequences. Apart from rides, shows and parades, there is also a special summer event going on called Rev Up Your Summer Fun! which is tied closely with the new CARS 2 film. 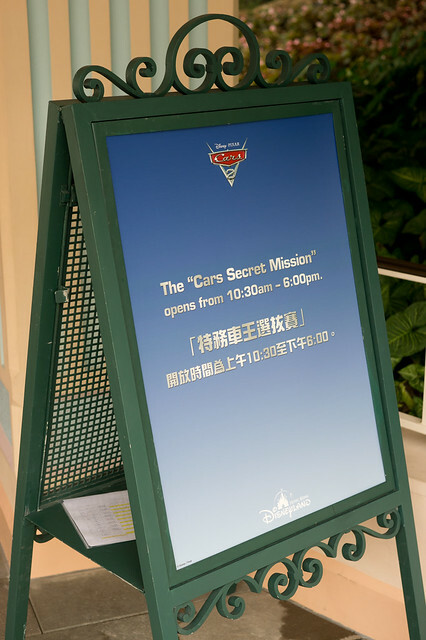 Cars Secret Mission is an activity that involves finding game stations scattered around the park and playing minigames. Players will need to get a little leaflet from a cast member (My sister’s holding it in the photo above) that has a QR code on it. 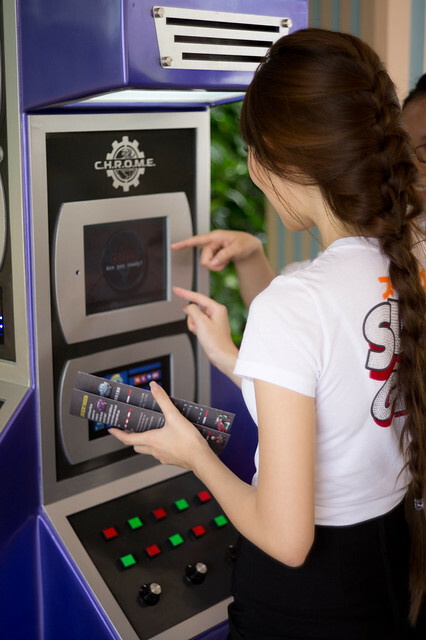 At each station, players will need to scan their leaflet and proceed on with a simple minigame, which varies from memory to “spot the difference”/”find a character” style games. Cast members will invite players to get a stamp on their leaflets. Upon completion of all game stations… you actually get nothing except for a (presumably) random Cars character profiling and a certificate which you have to print online on your own. Well, you didn’t pay to participate in this anyway. 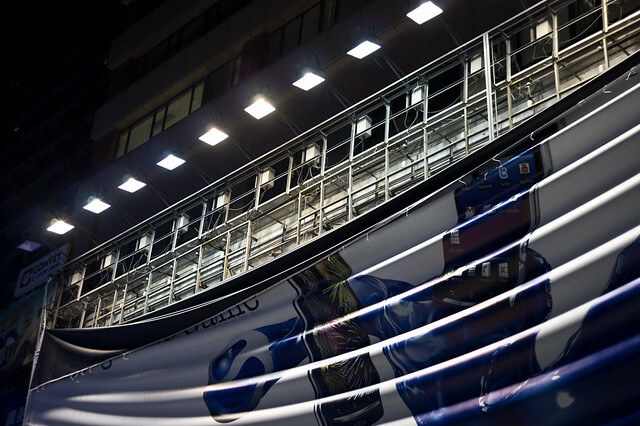 There are also Cars photo opportunity zones (which are actually, just large 2D installations) themed to certain cities around the world. It doesn’t just stop there – the theming continues with snacks offered at each zone, such as sushi rolls for sale at the “Tokyo” zone, for example! Queues for Festival of the Lion King, a short musical performance of the popular hits and compressed narrative from The Lion King. 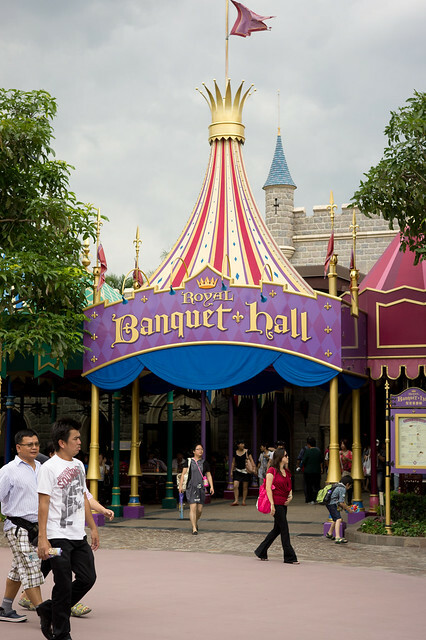 Royal Banquet Hall – We had lunch here. 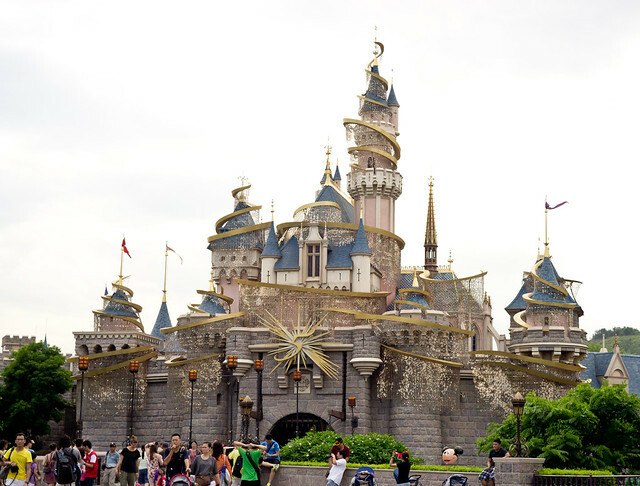 While not exactly comparable to the other larger Disney Parks in the world, Hong Kong Disneyland still retains Disney magic – with the successful formula in designing and running theme parks that Disney has decades of experience to rely upon. I have visited the park a handful of times for the past five years and the park has always been improving, with exciting seasonal and milestone events. Things will get very exciting at the resort when three new themed zones – Toy Story Land, Grizzly Gulch and Mystic Point – are completed in the years to come. 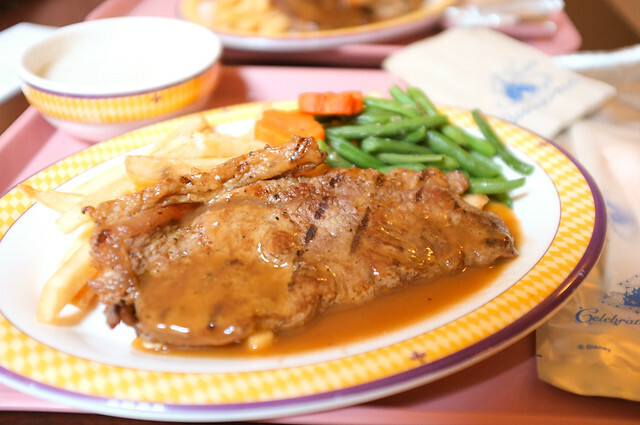 After spending almost a full day in Hong Kong Disneyland, we got tired of the heat and went back to Kowloon. Yep, we gave the evening shows a miss. 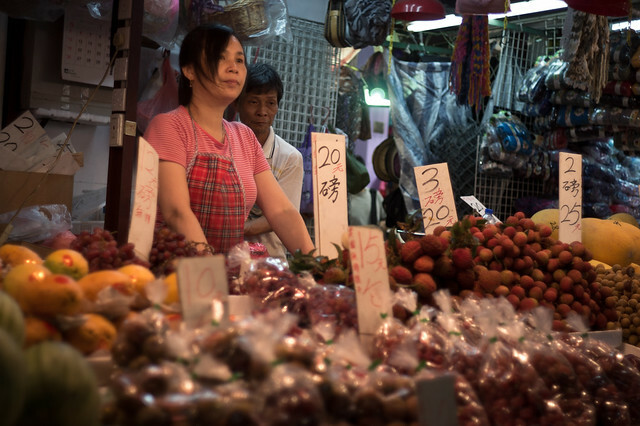 My family went to this night market street called “Fa Yuen Street” which translates to “Garden Street”. 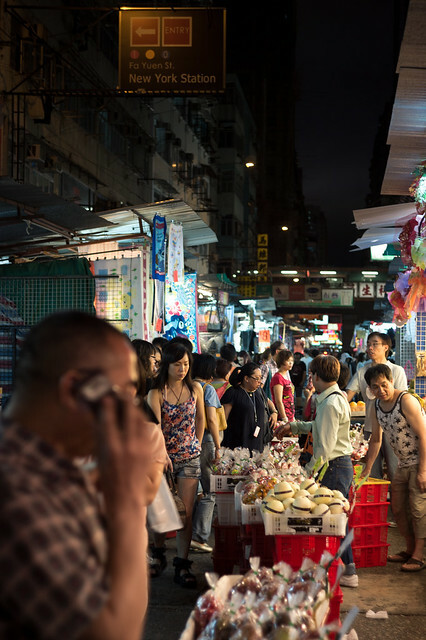 There’s always those usual night market stalls selling cheap clothes, souvenirs and trinkets. The more interesting parts are actually the shops hidden out of the florescent glow of the night markets though. My sister goes to a random shop and after some bargaining and trying them out – if I remember correct – paid S$80 for 4 pairs of shoes. I witnessed this interesting incident of a billboard being sabotaged and the canvas was flapping dangerously in the wind – it was fixed the next day though, which was good as the Typhoon warnings started coming up the next morning.